Collaboration and listening are key to meeting your content goals. This way, we eliminate "do it again" work. First, WriteFusion wants to understand who you are and what you want. We conduct an extensive, professional consultation to capture the details of your initiative. Then, we jump into client-focused delivery mode to render your solution, on point and on time. 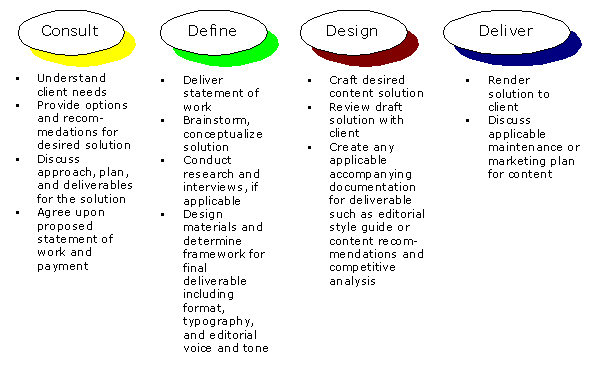 Consider the following phased approach and general activities to deliver your desired content needs. Each client solution varies. Therefore, specific content offerings will dictate precise tasks during each phase.